Cool! I’ve made this quick video answering some common q’s I get asked. If you’ve got even more questions (you’re curious! ), check out my eBook for kids and teens – Good Selfie. More info below. Got a school project and need some basic facts about my life? Check below for a free PDF you can download. So you wanna know more? OK! Everywhere I go, teenagers ask me epic questions like how to be more confident, how to get through crappy days or hard times, and how to achieve big goals. I love that they wanna know how to live a kickass life. So, I thought, why not collect a whole bunch of these q&a’s and share it around? Maybe my answers and strategies could be helpful for others too! 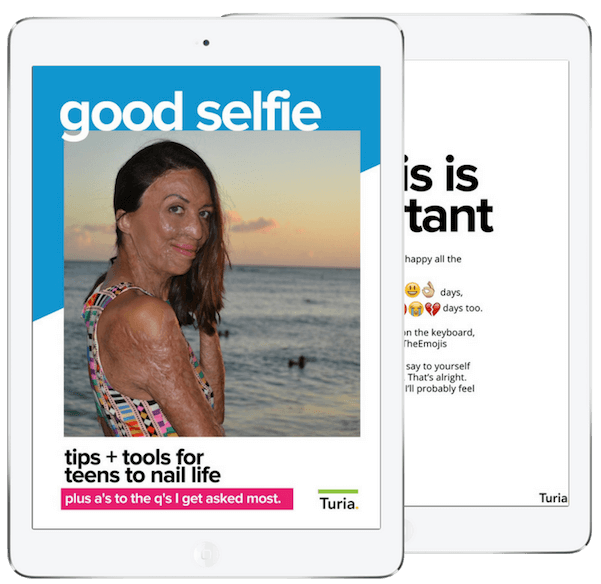 It’s all packaged up in one psychologist-reviewed eBook, written especially for teens, called Good Selfie – where I answer the questions teens ask me most PLUS share all my best tips & strategies to nail life. I've put together some fast facts about me to help you out. Download them by clicking the button below.